Is the iPhone's battery life actually better after five years? Measuring how long the iPhone lasts in the real world, from the original 2G model to the just-announced iPhone 5. It started as a joke about an iPhone 5 released in the thick of a national election: ”Are you better off now than you were 4 iPhones ago?“. But it got me thinking about how almost every iPhone (and laptop, and tablet) promises better battery life than the last version. At the same time, the features and hardware those batteries are powering increase with every release. So are we actually any better off than we were 4 iPhones ago, in terms of battery life? Let’s start at the beginning. The original iPhone, first available in June 2007, had a built-in lithium-ion battery that drew 3.7 volts from a pack with 1400 Milliamp hours. Every iPhone battery, up until the as-yet unopened iPhone 5, has operated at the 3.7 volts. As explained around the web, milliamps hours (mAh) are something like a gas tank, and voltage (V) is the amount of fuel the device is drawing. That's why it's notable that the iPhone 3G, released one year later, dropped to 1150 mAh, despite being a slightly thicker device overall. Apple needed to make space for what was then a newer 3G radio. How much difference did that smaller battery and a newer radio make? Quite a bit. Apple claimed the original iPhone could power 8 hours of talk time and 250 hours of standby, using an older Edge (”3G”) network connection. 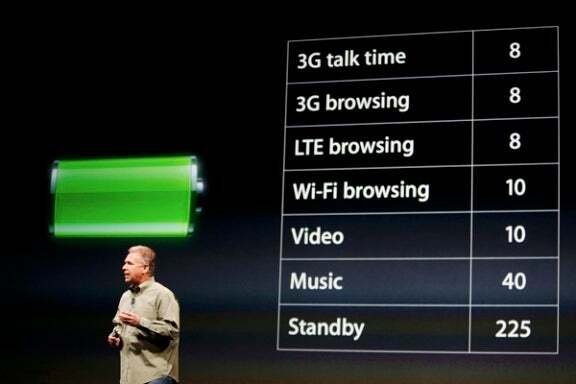 The iPhone 3G, according to Apple, would run a bit further: 10 hours of talk time on 2G, and 300 hours of standby. Battery life with 3G enabled was 4 hours and 44 minutes, down from nearly 6 hours when I tested the original iPhone. Turning off the 3G modem and switching to Edge, my call time went up to 6 hours and 4 minutes, about where it should be based on my original iPhone test results. With less than 5 hours of talk time, if you plan on doing a lot of talking you had better shut off 3G mode on the iPhone. When used on 3G networks either as a phone or data device, it achieves only a meager 5 hours of calling time on a full charge -- the same as the iPhone 3G -- and even less if you're using features such as Bluetooth or GPS at the same time. In a mixed-mode test. . . the iPhone 3GS's battery lasted for 4 hours and 44 minutes of actual use, with an additional 17 hours on standby. . . iPhone 3GS's poor battery life thus makes it a bad choice for road warriors who have heavy calling needs. Compare iLounge's take on real-world 3GS use to the AnandTech's 3G review: four hours and 44 minutes each, on the dot. Next was the iPhone 4, which was, on many fronts, the biggest change since the beginning: a high-density Retina display, a notably new design, and a 1420 mAh battery somehow shoved inside, 20 mAh over the original. Apple’s statements on battery life claimed seven hours of talking on 3G, 14 hours on 2G (compared to the original iPhone’s 8-hour claim), and 300 hours of standby time. In testing, MacWorld’s heavy usage saw the iPhone 4 lasting about an hour longer than a brand-new 3GS, while iLounge plainly stated that the iPhone 4 had battery life “roughly equivalent to original iPhone.”. The iPhone 4S? It added 12 mAh to the battery, totaling 1,432 mAh, and claimed eight hours of 3G talking usage. On some network tests, the iPhone 4S did even better, clocking 9.2 hours of 3G talk time. Then again, in regular human use, the iPhone 4S suffered from software-related bugs that saw marked battery drain, resulting in some rather distrungled Apple support threads. Overall, given the increase in hardware power, the upgrade from an iPhone 4 to a 4S meant a slight increase in battery life, but nothing too significant. @kevinpurdy iPhone was 8h talk, iPhone 3G + 3GS were 5 unless you fell back to EDGE. iPhone 4 = 7. More or less steady since. 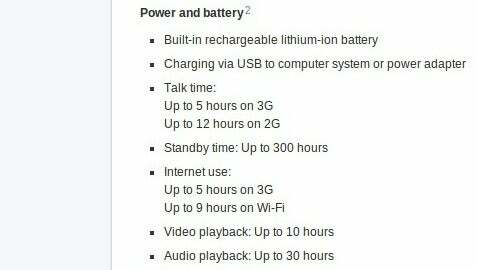 Synthesizing the rumors and supposed leaks about the iPhone 5, it packs a 1440 mAh battery, draws 3.8 V, and Apple claims it will deliver eight hours of 3G talking time, or the same eight hours while browsing on 3G or 4G LTE networks. Tests and assessments from reviewers and pundits will come next week, but will undoubtedly deviate from Apple's numbers. It’s no small thing, packing all that upgraded hardware into a phone that’s smaller than it first was, doing much more all the time, and keeping battery life from falling off a cliff. Nobody should pretend that the iPhone 5 has the same power requirements as the original iPhone, nor that every user will fare the same with their phone and data habits. But no matter what, still feels odd that five years later, the iPhone doesn’t deliver the battery life it once did. It makes one think we’re reaching the end of what energy optimization and lithium-ion batteries can accomplish. It makes me hope that energy and battery research laboratories are very hard at work, making the new and intensive look like the light and simple of five years ago. When it does, you'll feel like charging your phone at 3 p.m. every day is a story you can tuck away for your grandkids.